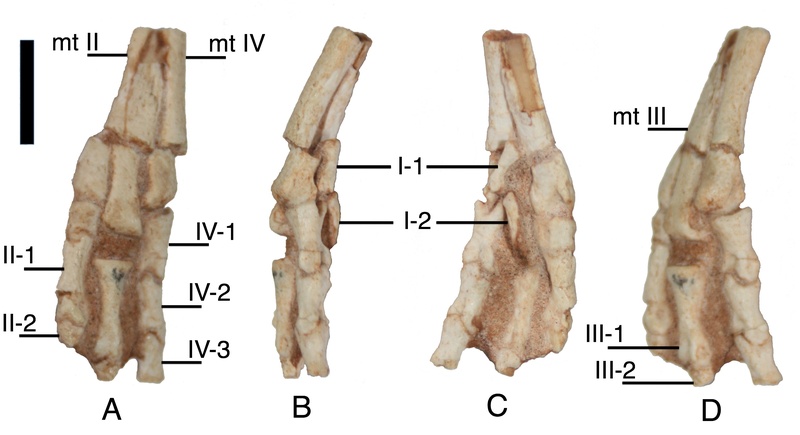 What’s awesome here is that in animals that have this distal expansion of MTIII, for example CMN 8538 (holotype of Macrophalangia canadensis = Chirostenotes pergracilis), the cross-section of the shaft at this point is quadrangular, with only slight concavity of the sides where MTII and MTIV articulate and abut MTIII. There is no distinct overlying flange, a unique and ridiculous oversight for otherwise studied alvarezsaur pes! I was actually surprised when I read this, and jumped back into the lit to find out where I recalled MTIII’s being compared extensively in their cross-section, and all I can find his Tom Holtz’s thesis. Wow. Incidentally, “Ornithomimus” elegans Parks also appears to have a flange on MTIV that abuts MTIII medially, a feature that appears to be diagnostic for the taxon and/or present in a range of specimens from the late Campanian up to the late Maastrichtian which have been referred to that taxon. Such strange feet in arctomet and subarctomet theropods. So…does this lend support to the alvarezsaur+ornithomimosaur hypothesis, or does it just indicate the arctometatarsalian condition is homoplastic and widespread amongst Coelurosauria? Well this specimen specifically says nothing about it – we already knew that the arctometatarsal condition was massively homoplastic as it’s absent in so many basal forms and the actual details of the anatomy are different between most of the groups (though we do summarise all of this). What it does is talk about some of the details of the anatomy and putative functions.